Grab yourself a beer. Philosophical ramblings on beer are probably best served with a beer as accompaniment. And preferably a beer you like and want to re-brew or brew something similar to. That will help for the following discussion. I'd like to present a rundown of how I go about formulating recipes, focusing on the thought process I go through for ingredient and process selection. On the logistics/calculations side I use BeerSmith, so I won't do any discussion of calculations/etc. I also won't spend time on ingredient selection in the sense of not using old/bad malt or hops. You should taste and smell your ingredients so you get familiar with what good hops of a given variety smell like compared to bad hops, and what fresh malt tastes/feels like compared to stale malt. In full disclosure, I'm a person that spends an unreasonable amount of time thinking about beer and I try to take pretty detailed notes. In-depth thinking about beer is part of how I approach it and I enjoy it but it might not work for everyone. Not everyone is in a beer or brewing-related hobby/business to spend lots of time thinking about beer (though those people probably don't spend much time reading blogs either). So no worries if this isn't for you. But this is how I do it. I don't mean to suggest that this is all easy and this is probably geared to the intermediate to more advanced brewer. But I think the considerations I discuss below can be helpful to some degree no matter what level of brewing you are at. If you are just beginning and are making your first recipes, taking initial steps toward thinking in this way will help you ask questions to be more likely to get the answers you are looking for more clearly. When a brewer says something like 'I want to brew a -blank-' and asks for advice, I regularly follow that up with questions about the different directions within that idea/style/etc. which one could go to try to best be able to offer guidance toward their end goal. And if you are very experienced with making recipes, thinking in this sort of way will make active ingredient and process decisions easy (rather than just doing something a certain way because you've always done it that way or because someone else did it that way). of notes to help this: brew logs at bottom left, commercial beer notes at bot. right and travel/brewery visit notes at top left. Motivation and intention: To me recipe formulation starts with and spends the bulk of the time focusing on motivation and intention. I think one should always go into a brew thinking about their motivation behind the brew and their intention with the finished beer. This may seem fairly rudimentary, but I think that it doesn't happen a surprising amount of the time. For most of my brewing years I didn't really stop to think in detail about what I really wanted in the final beer beyond the base style and following a more or less random recipe. So I mean going deeper than something like I want a saison, or I want a hoppy sour beer, etc. Perhaps you are brewing to try out a given ingredient or process. What setting do you want to test that in? Something that makes the difference easiest to see, or a setting where you are most likely to actually want to use that ingredient or process? Both have their merits and limitations. Or perhaps your goals are more finished beer-driven. 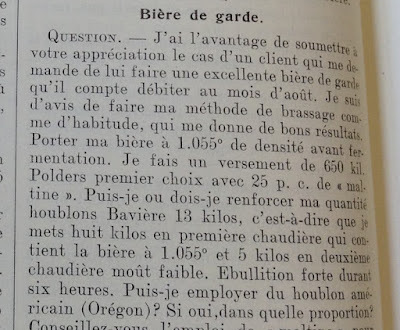 If you want a saison, what strength? What sort of hop presence? What color? Do you want it to be balanced more toward fruit/esters or spice/phenols? Or an even mix of both? What sort of body are you looking for? Maybe picture a commercial example you know and like. In an ideal world, how might you want the final characteristics changed to make it your ideal beer? Spending more time nailing down your motivation for the beer in question and your desired result in the finished beer are the first big step - you know exactly what you want. this beer has inspired me considerably in making recipes. So I start with basics and step forward from that to target details and what ingredients and/or process will get me there (or ask questions/research/set trials to learn what will get me there). This can make recipe formulation an easier step-by-step process and/or help you choose between different already published recipes. Note that building the skills to do this may require similar critical thinking about beers you drink to come up with a good sort of context for the direction you want your soon-to-be-brewed beer to head. Talking to brewers is a good way to augment this critical tasting of commercial or homebrewed beer. Setting fundamental goals: Okay, so you've thought about the motivation and intention. I break that into a few fundamental goals to work from. To illustrate my process, I'll work through the following recipe formulation with a low-OG saison. I think this sort of thinking is much more valuable than simply giving a recipe, as hopefully it helps others to think in more detail about their brews and improve their brewing. I am planning a recipe/brewday post on the same beer in the near future, so don't worry - an actual recipe is coming. The basic essential elements that I am looking for in my homebrews of low-strength saisons or my favorite commercial examples are: A) a refreshing/thirst quenching quality, B) sufficiently low strength that I can drink multiple, possibly during the daytime, without feeling the effect of the alcohol, C) something that doesn't taste/feel especially watery or thin and D) good yeast expression, balanced toward floral/fruity but without anything toward bubblegum. These basic motivations will drive all my recipe/process decisions behind making this beer. Keep in mind that all of the following are based on my personal tastes. Turning those goals into process: Those were pretty basic goals. I don't mean to suggest that the following is easy and obvious. Knowing the results of recipe and process changes can come from trials, research, and discussions with other brewers but they aren't inherent knowledge. 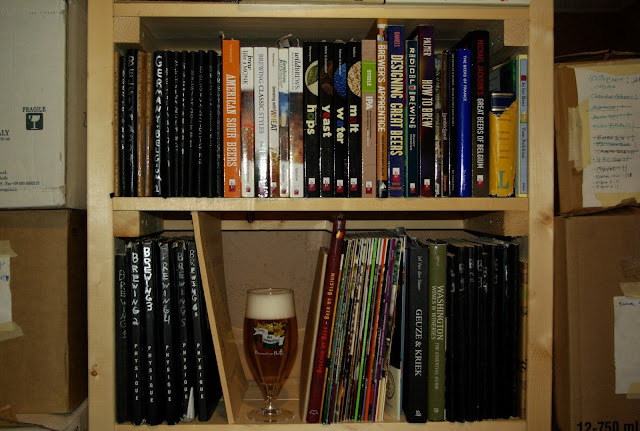 The following breakdown of my goals comes from years of experience in my own brewing, discussions with fellow homebrewers as well as Belgian and French commercial brewers, and reading about saison and Belgian brewing. That experience was built slowly, piece by piece, and thinking in this way helped me to build it and connect those pieces. Taste testing two different base malts. Goal A means that I want a fairly firm bitterness (keeping in mind the context of the OG). By my experience (commercial beers I like and homebrews) this means a BU:GU ratio of about 1.25 [Edit 21-Sept-16: 1.0 is more representative of a larger number of recent beers. I have done low-OG saisons with 1.3-1.4 that came out with the bitterness I was looking for, but I think the bitterness calculation was a fair amount higher than what I actually got for those, probably due to the hops I was using. By re-brewing the same recipe with the same hops but increasing the hopping, I was able to get the bitterness I wanted by going up to 1.3+]. It also means that, to my taste, I want the bitter/flavor qualities of noble-type hops rather than something like typical Pacific NW IPA hops. I find IPA hops to bring a perception of sweetness with their fruity flavors as well as a resinous quality, both of which detract from a refreshing quality to me. I find a more resinous or pithy bitterness can clash with the dryness of saisons and the yeast to me, such that the finish can be a bit harsh in a way that doesn't leave me wanting another sip. So I want a more delicate fruity/floral and a firmer spice/herbal character and I don't want something resinous. It also means that I want a pretty forward hop flavor, therefore I'll be loading up on finishing hops and dry hopping. But through my experience I have found that if I go too far in the finishing hop direction, while I may get great hop flavor, something is missing in the perception of a drying bitter finish. The exact breakdown here will depend on aa of my hops and such, but I've been happy recently with a roughly even split in theoretical IBUs from "bittering" and finishing when using low alpha hops to finish. I quote bittering because to me this could mean 30 minutes left in the boil. Finally it means that I will want to keep the grain bill rather pale to let that crispness come through. That means a base of pils malt is good. Some Vienna, or a move in that direction, would also be fine as the OG is so low. That basically settles the hops in terms of variety, usage rates, and schedules of additions. And it gives me a pretty good constraint of my malt bill. I am looking at grains no darker than Vienna. Goal B means that I am shooting for something at or below ~3.5% ABV. The corresponding original gravity for this will depend on mashing and yeast choice. I have been working on raising my FGs a bit so that my OG can be up to 1.030. Getting the ABV down to about 3.5% with a 1.030 OG came from changing my yeasts and changing my mash profile. Goal C means that I want to maximize character from my grain and mashing process, as grain level will obviously be the one factor most restricted by my ABV target. Mashing in a bit more of an intensive way to maximize extraction and development of flavors will also help and, depending on yeast choice, mashing for less fermentability could help. I generally try not to do this with 3711 as the yeast seems to attenuate quite a bit of stuff that others won't so it can just end up extending the fermentation timescale. For the same reasoning I would not mash for low attenuation when making a beer with brett that I also wanted to be a quick turnaround beer. Building body with certain grains like oats or rye and selecting yeast for more glycerin production can also help to build more body if you are looking for it. Finally, dry hopping can add a nice structure in addition to the flavor/aroma that it brings. Pulling starchy wort during a turbid mash. So to sum this up, for my tastes I will probably choose a more intensive mashing profile (more on this to come in later posts) and flaked grains and then dry hop with noble or noble-type hops for both the flavor and structure components I am looking for. Goal D is fairly straightforward - it means that I'll choose a yeast blend or single strain and fermentation temperature profile that I am pretty happy with. Or if I want to try something out or don't know what strain/blend/temperature to use then I'll test some out, likely by splitting a batch to help constrain variables in the test. A mixed yeast and bacteria blend can be a great way to add fermentation complexity. Think about something like Le Petite Prince with a bit more age or Jolly Pumpkin's Bam Bière (which, at 4.5% might be a bit stronger than the rest of this example focuses on, but that can be scaled back if needed for your goals). Mixed culture expression will of course come as a trade off with hop impression, which again comes back to careful consideration of what you are looking for. For my recent beers, since it was already summer by the time I was brewing, I focused on quick turnaround. From travel experience visiting the brewery and talking with Daniel, I knew that the Thiriez yeast was a great choice (see this somewhat dated post from my visits there as well as this post from Farmhouse Beer Blog). Note that the fermentation appearance of this yeast, the flavor profile, and the behavior (especially attenuation) are different from Wyeast 3711, of which Brasserie Thiriez is reportedly the origin. So from these 4 goals, I have set my OG and IBUs, the hops I am going to use and rough hopping schedule, most of the grist, and my yeast choice. I've also got a good direction to go for mashing. And since I've chosen my yeast I have a good idea what sort of fermentation profile to use (or what ranges to test in a split batch). In the coming week(s) I'll wrap this exercise up with the actual recipes this thinking led to in a post to come on the brewdays for some recent low-OG saisons. Closing thoughts: Following this through exercise is best as a cyclic process. Design the beer, brew it, and then taste. While tasting it, think about your recipe and process, which will help you learn how specific ingredients and process led to your beer. Also think about what direction you would like it to go with the beer for next time. Having a good starting point for directions to grow helps narrow down the goals quite a bit, which gives you a great head start for repeating this exercise. Ok, that's if for now. As said above, none of this is an easy process. Any level of brewer will learn as they go through this to better understand the results of ingredients and process changes/choices. So don't feel overwhelmed by this and if you don't know the answers you are looking for, read/ask around for advice and/or design trials to figure them out for yourself. Nice post. I agree about fruity or resinous hops. For me the former only work with a bit of tartness to cut against the fruitiness. Without that, an otherwise dry beer will seem sweet to me. I found that with Bouket by Trillium/De Proef, which was a really well made beer. Thanks Amos! Yeah exactly, they can turn a dry beer sweet. Good point about that being cut by some tartness. Thanks for adding that insight! Knowing other brewers thought processes when it comes to recipe formulation is reassuring when it closely resembles your own. Most of my recipes are planned before I even start thinking about ingredients, it's what qualities and character you want in the beer that comes first, then the ingredients needed to meet those qualities. Exactly, those are my thoughts as well. Sounds like this has been mutually reaffirming in regards to process.